The highlight of this years cultural exchange programme will be a concert on 2nd June at Kino Ebensee / Austria performed by Mokoomba - "Zimbabwe's hottest export" (Songlines) and joined by Isabelle Duthoit /FR and Franz Hautzinger / AUT who will musically reflect on their visit to Siachilaba on their way to HIFA in 2014. On the 26th of January, we enjoyed the Vernissage of the exhibition "Tales of Resilience" at the Aktionsradius in Vienna. On 19th July, our exhibition "one man - one note" ReCalling Siachilaba at Kunsthaus Deutschvilla in Strobl / Wolfgangsee was concluded with an inspiring finissage concert by Fadi Dorninger (Simonga-Maliko Parade Linz09 Remix), Otto Lechner, Toni Burger, Karl Ritter (Windhund goes Zimbabwe revival) and by our special guest from Zimbabwe Hope Masike, who has been featured again in Werner Puntigam's mbirations with Klaus Hollinetz. The concert and the exhibition as such met an excited response and applause. 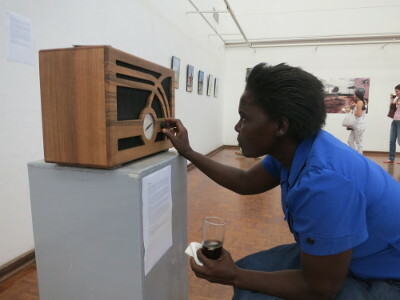 Visitors contributed 1652 Euro to ongoing projects in Siachilaba (womens foto studio) and Sinazongwe (Zongwe FM radio). Thank you all for your contributions, especially the artists and for your support. Twalumba! 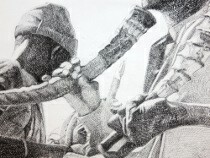 The picture shows a detail of the huge drawing (2x3m) of a Ngoma Buntibe performance of Simonga-Maliko by the artists Georg Ritter and Hanna Piksarv. This artwork is based on photographs taken at the joint rehearsals of Simonga-Maliko in Binga prior to their journey to Linz / Austria in 2009. It has been shown as part of the current exhibition of Ritter/Piksarv at the Deutschvilla in Strobl near Salzburg. Georg Ritter is a multimedia artist from Linz / Austria and has been involved in cultural exchange with the Tonga since 1995 in close collaboration with the late Keith Goddard. Hanna Piksarv is a young artist in various fields from Tallinn / Estonia. Mokoomba will be touring Austria in June - Welcome - Mwabonwa! Looking forward to welcome you in Austria! Mwabonwa! Im Anschluß an das Gespräch wurde als tribute to Keith Goddard der Film “Across the River” von Michael Pilz und die Parade Dokumentation von Dariusz Kowalski und Peter Kuthan gezeigt. Die Filme sind nun ebenfalls auf dorf TV abrufbar! The Young Ngoma yaBuntibe Group of Mucheni, together with five students from Binga High School, traveled to the Victoria Falls on 14th May to take part in the 2010 Culture Week Launch that was held at Chinotimba Stadium. The Theme for this years culture week was “Zimbabwe`s Cultural Diversity at Thirty” referring to the thirty years of independence and the relevance of cultural diversity for the young nation. The occasion was graced by The Honorable Governor of Matabeleland North, Mrs T Mathuthu, The Zambian Education and Culture officer, Mr Zimba, The National Arts Council Director and the Culture Fund Director, among others. The Mokoomba youngsters from VicFalls have been voted to represent Africa at the Global Campaign Against Poverty in the Netherlands / Europe! After winning the interregional Festival and winning the opportunity to tour around Europe, then seeing their dreams falling apart by the cancellation of the tour due to Visa issues, they finally get what they deserve. Mokoomba battled for the top spot with East and Southern African groups, 16 of them Zimbabwean, including Andy Brown and The Storm, Nina Ogot, Just a Band, Victor Kunonga, Xtra Large and Lyadia, among many others. The Victoria Falls-based band sings mainly in Tonga, a language foreign to even the majority of Zimbabweans, but they have still managed to break the barriers and prove their talent on the biggest of platforms the world over. The Tonga.Online project has become a reference point for Austrian (and South African) media artists again. The Austrian artists duo MACHFELD will start an artist in residency in Johannesburg / South Africa soon and explore the Binga - Hillbrow connection, the routes and linkages which exist between rural Binga area in Zimbabwe and the notorious suburb of Hillbrow / Johannesburg which is hosting various migrant communities, i.e. from Zimbabwe. Therefore MACHFELD will visit Binga and the Tonga.Online / MULONGA.net project in early 2009 to start with their action research. live concert + CD Präsentation "mbirations - more of rural-urban chamber music"
photo essay "zimbabwe, quo vadis?" The second Africa Remix panel discussion – Digital Africa - took place on Saturday, July 28 at the prestigious Johannesburg Art Gallery JAG in Johannesburg / South Africa. A special input for the discussion was provided by Keith Goddard in a live interview via cellphone from Sinazongwe in Zambia where he has attended the annual traditional Lwiindi ceremony and the opening of Sinazongwe Community Radio station. Keith explained the joint endeavour of the Tonga.Online and Tonga.Onair projects to use modern digital means for the promotion and development of Tonga music and cultural heritage. The summary report of this interesting and critical panel discussion is out now on CD Rom and online. Good news for the Tonga.Online project from Mica – the Music Information Center Austria, which has started the Fair Music Initiative recently. On Saturday 8th September the project received the newly-created Fair Music Award in the context of this years Ars Electronica Festival - together with female:pressure, Freibank Music Publishing, and Extraplatte as this years other laureates. The second Africa Remix panel discussion – Digital Africa - took place on Saturday, July 28 from 10am to 3pm at the prestigious Johannesburg Art Gallery / JAG in South Africa. ‘Africa Remix: Contemporary Art of a Continent’, running at the JAG until September 30, features the work of more than 85 artists from 25 countries on the African continent and in the Diaspora. The exhibition has already visited Düsseldorf, London, Paris and Tokyo. The annual traditional Lwiindi ceremony at Sinazongwe is a function where the Tonga people appease and thank their ancestors for what they have done for them in the just-ending agricultural season. Central to the ceremony is the visit to the Malende site and shrines where the hosting Chief pours traditional brewed sorghum beer onto the graves of the ancestors whilst their spirits are called by nyele horn blows and clapping hands. Siachilaba Primary School during the visit of visitors from AZFA / Austria and Horizon3000 office in Harare. Listen to an interview with Keith Goddard on the situation in Zimbabwe. It was recorded in November last year when he met with Ruth Ritter, mother of Georg Ritter who was mastermind for the Tonga expedition across the Dead Mountains in Upper Austria. The interview will be broadcast tonight, 12th February from 7 till 8 hours pm @ "Infoschiene Amnesty"
with popular music clips from Zimbabwe! Stay tuned and listen Radio FRO 105,0 Mhz !! The links above didn't work for you ? WinAmp: Ctrl+L and the same as above. Silver Server, the biggest independent Internet Service Provider in Austria, has been supporting the Tonga.Online project since its inception by hosting the website Mulonga.Net free of charge. The recently published SILVER Magazin # 10 is carrying a story about Mulonga.Net and the ongoing cultural exchange between Austria and Zimbabwe, written by Astrid Schwarz from Radio Ö1 Austrian Broadcasting Corporation after she met with Keith Goddard and Peter Kuthan end of last year in Vienna. Astrid Schwarz will be featuring Tonga.Online / Mulonga.Net also on air in the Radio Ö1 Science Magazin Matrix on Sunday 21st January at 22:30hrs. Thanks to Silver Server and Astrid Schwarz for promoting Tonga.Online – Twalumba! Stay tuned and listen! Of course we will download the feature and put it onto the website soon. To date, Valley Tonga music remains virtually unexplored by researchers and is generally unknown outside the Tonga area. Hugh Tracey, the famed Afroethno-musicologist, was invited to the Gwembe Valley for ten days in 1957 by the Rhodes-Livingstone Museum,"to record some of the music of that section of the Valley Tonga tribe which will be forced to leave their riverside homes when the water of the Kariba Dam begins to rise next year, 1958." Presentation of calendar "signs of life 2004"
In the first week of February 2005, the Batonga Museum in Binga, in collaboration with Tonga.Online Project facilitated an instrument-makers workshop for the purpose of building a set of marimbas tuned to the sound of the local Kankobela, specifically designed for the playing of Tonga music, in particular the music of the Kankobela and the Nyele. Creative artists from 71 countries submitted 2,975 works for Prix Ars Electronica 2005 . . . The Prix Ars Electronica is produced by the Ars Electronica Center in cooperation with the ORF Austrian Broadcasting Company’s Upper Austria Regional Studio, the Brucknerhaus Linz and the O.K Center for Contemporary Art. Ever since its inception, the competition’s focus has been on state-ofthe-art creativity in the key fields of digital media. " - Prix Ars Electronica website . World Culture Forum: From Information Societies to Knowledge-based Societies: Sustainable Development or the Deepening of the Digital Divide? When five Austrian artists visited Siachilaba in 1997 to take part in the “NYAMINYAMI Festival Celebrating Tonga Culture”, they made a stop over at Simon Mashoko´s place near Masvingo. Following this encounter with the great master mbira player they came up with an acclaimed foto/video/sound installation at the Gallery Delta in Harare in January 2002. Werner Puntigam, Klaus Hollinetz and Michael Pilz will present their impressions and installation again at Gallery Habari in Vienna from 26th February (opening 7 p.m.) onwards (and in Graz, Linz, Munich and other places later). listen to "konjila" , a sample of the outcome of the workshop. see images of the workshop. A music workshop participant from Choma / Zambia, Patrick Mweemba, staged an exhibition of some of his work (wood and linocut prints) at the Binga BaTonga museum. There was another chance to listen to Ngoma Buntibe, Kantimbwe and other styles of amazing Tonga music from Zimbabwe and Zambia on Austrian Radio Broadcast Channel 1 / ORF Ö1 Radiokolleg from Monday 13th until Thursday 16th February daily in the morning. Radio FRO is based at Stadtwerkstatt Linz / Austria which has always been a hub for arts and independent media promotion and production. In 1997, Stadtwerkstatt organised the expedition of the Tonga Ngoma Buntibe group Simonga (from Siachilaba) across the Dead Mountains in Upper Austria as part of the "Festival der Regionen" in collaboration with AZFA and Sunnseitn. A capacity building exercise and skills training will be held at Binga ITC / Twiimbilane Studio in cooperation of Austria Zimbabwe Friendship Association and Kunzwana Trust. This workshop will be held for technically already advanced and computer literate persons only as a Training of Trainers / ToT exercise. The Symposium will be held at the Donau Universität / Danube University in Krems / Lower Austria on 29th / 30th July, in the framework of the prestigious World-Music Festival Glatt&Verkehrt. One of the forum sessions on Friday afternoon is featuring Tonga Ngoma Buntibe Music and the recent cultural exchange with Austrian Windhund musicians Melissa Coleman and Karl Ritter, the composer Klaus Hollinetz and the film Across the River by Michael Pilz. We are excited about the donation of another 25 AlphaSmart 2000 devices for Tonga.Online extension by AlphaSmart Europe Ltd!! 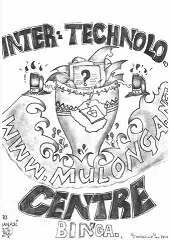 Buy a Brick Campaign for an Internet Centre in the Tonga Area!